Hey! Today at my home it poured with Rain for the first time in weeks - in Scotland that’s something that normally happens at least every other day! Something is going on with the worlds weather and using my dogsense, I’ll tell you all. It was great to be out walking in the country with no fair weather ramblers poppin’ up to distract me. It will soon be winter and the evening walks will be in the cold and dark - great!!! I won’t post any holiday snaps up today - just an interesting little work of art available from corsini uk - this isn’t no financed ad or promotion specifically for this company, as I am a dog and only trying to point fans in the direction of images of my brothers and sisters for their personal pleasure. I get no reward from this, other than the goodness from knowing some of you may enjoy finding these objects. The painting is by an artist named Mick Cawston and the piece is entitled The Scotsman. 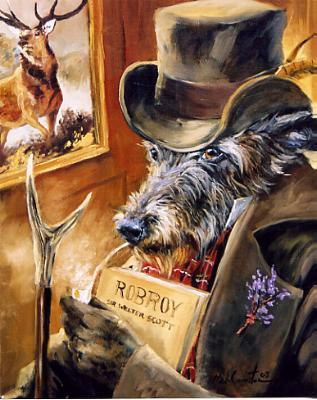 It’s good to observe a hound reading literature with such an admirable subject matter, good author and hero of such good Highland politic, whatsmore, another Rogue to-boot!